QuiltNSW Blog: Can you help? The Guild has had the following enquiry from the Social History and Exhibitions Curator of Fairfield City Museum and Gallery. If you can help, please contact her direct. I am wondering if you are able to help me with an enquiry we have about a quilt which is currently in our collection. We do not have any information about who made the quilt or when it was donated to the Museum so I was therefore wondering if someone in your organisation had either seen the quilt before or knew someone who made this particular type of quilt. We are hoping to track down either the owner or the person who donated it to the Museum. 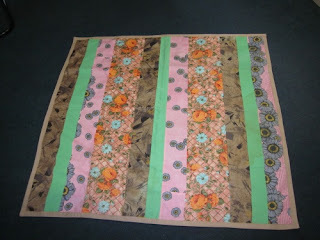 I have attached a picture of the quilt. Any assistance you can provide would be much appreciated, I realise this is very much a long shot!